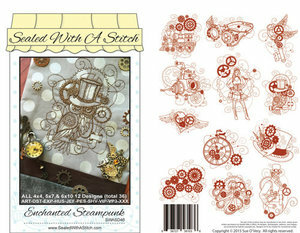 Gears, steam, keys and top hats can mean only one thing…Steampunk! This Enchanted collection captures the highlights of the Steampunk revolution. Collection includes: Steam engine with gears coming out of smokestack, Goggles with gears and wings, Wing key with gears and swirls, Submarine with fears and swirls, Steampunk diva with gun and gears, Owl with monocle and top hat, flying heart with clock gears, Unicycle with roman numeral clock as wheel, Clusterof gears, Octopus with gears surrounding swirls, Top hat with clock pieces and gears, Steampunk gentleman with vest and gear backdrop. All ready to stitch in the 4x4, 5x7, and 6x10 hoops.